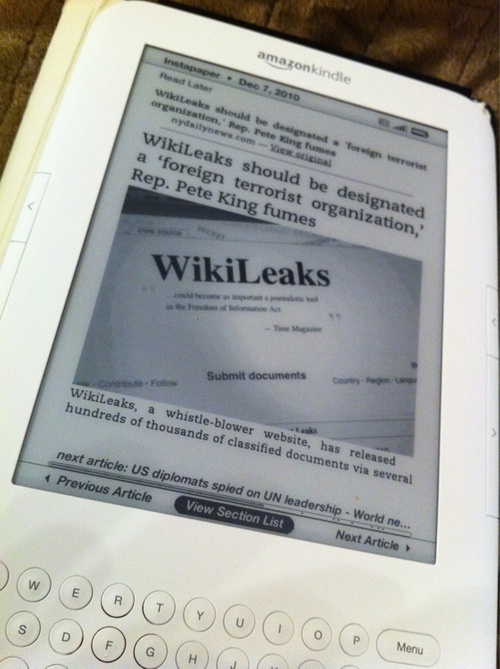 An article referenced on the Wikipedia page on Wikileaks piped to Instapaper and in turn to my Kindle. A week ago I hatched a plan to educate myself in a more structured manner on what exactly Wikileaks stands for, its history, and its possible futures with the idea of developing a more concrete and informed opinion (and since I have a habit of taking action with respect to my opinions, thereby guiding my future actions). After seeking some advice about what to read via twitter and starting with this Julian Assange essay as a basis–a very good one for some philosophical background of the larger aims, I spent awhile digesting the Wikipedia page on Wikileaks before deciding I wanted to fact check its assertions and that its references might serve as a springboard the next step in my studies. automatically adds all urls referenced on page_url to the Instapaper account with the given username and password. Instapaper takes care of formatting their content in a nice manner and allows one to export the content easily to the Kindle which was the aim of this exercise. I’m 120 documents in, with documents being added to the list daily, so feel free to suggest more. In fact casting a wider net for documents was one of my goals of my writing an intermediate post. In addition, I’ve read Assange’s blog circa 2006, and which while some dismiss his writing as “pseudo-intellectual online diatribe[s]” Assange states that “when writing I like to extremise my perceptions inorder to give them clarity” which spins the mildly manic and at times sophomoric writing in a nicer light. It’s for the reader to decide (more on that later) but is certainly worth a read. Many mainstream media articles assert things without linking to their original sources, even if publicly available. While I understand that printing all sources in print media is not possible, it’s something I’ve come to expect from the primary non-fiction reading I do: scientific papers, Wikipedia and Mathworld articles, textbooks, popular science and history texts, etc. As it is perfectly possible to include references to original sources in this day in age for articles in their online form or even in a short appendix with URLs in a print document, I am dismayed it is not common practice. Not having access to citations is disorienting and misleading, although since I have cast a wide net I usually run across the original source somewhere in the course of reading. But if you recall that while Wikipedia has citations, the documents I am reading are its citations. So the second layer of the onion is that most citations on Wikipedia for this particular Wikileaks article are not primary references and unsatisfactory. While I’m certainly happy to at least have citations on a Wikipedia page, vs. none at all for mainstream media, upon closer inspection they aren’t true citations in the academic sense if one is to maintain a healthy skepticism about the trustworthiness of media reporting and summarizing (in my limited personal experience with interacting with the media they frequently misquote and mis-summarize so I think the request for original source/transcript is justified). although I need to continue to dig before crystallizing if I believe Wikileaks is actually achieving this aim, and if so in the best manner possible. The very nature of this research project, the shotgun following of the sources of an article, many of which weren’t sourced themselves convinced me of the fundamental importance of this concept of scientific journalism and led me to read that at least ostensibly Assange is on the same page. The shotgun methodology I’ve used in my script isn’t the best or most efficient way to do background research. This methodology is more useful to get a gestalt picture on the subject. It also shows the gamut of biases making their way flagrantly into a newspaper near you in sharp relief. I run across the same article countless times, with wording changed, a summary tweaked, meaning added or removed. Another side benefit to the methodology is having a record of the majority of sources I have read on the subject, handy for citing in conversation or future blog posts. A lot of reading later, I still don’t have a comfortable rock on which to stand and refer to as my position on Wikileaks which has convinced me to time permitting add a stage two with targeted reading of original sources (including leaks themselves) and hand verification/exploration of a few questions I’ve developed along the way. At a minimum I’m willing to stake the opinion that the dialogue Wikileaks is inspiring is a good thing, wholesale, and my associated reading has gotten me back into the philosophical and political mindset I used to hold so dear as to consider it my identity. When I was young I was passionate to the point of hysteria about American politics, until I truly appreciated with open eyes the many other countries and cultures which already had internalized and bureaucratized everything I was fighting for. I asked myself a question: given an opportunity to move to your country in its ideal future, would you? And after some reflection, I answered yes and have been moving to and from the future ever since. One year in Denmark, 3 months in Norway, 3 years in Switzerland. None of these places are perfect, and in fact Denmark and Switzerland in particular are each plagued by variations on the xenophobic theme, but the U.S. is not only xenophobic against foreigners, it is seemingly xenophobic against its own citizens, anyone outside of the ruling socio-economic class, and is 50 years behind the social structures in place in much of Europe to boot. Moreover, the reason why I turned from politician to programmer was that I believe the future of political change lies in technology not in bureaucracy and the more organizations that we have manifesting this new reality, of which Wikileaks is one clear example, the brighter I think our political future will be. Communication is now at light, not at horse, speed and the antiquated political apparatus creaks under the onrush of photons. For an up to date report on the project, please follow me on twitter. Hi Christine. We’ve had a number of friends in common ever since LiveJournal days — I came across your blog on the intergoogs and found the “productivity” tag interesting. I happen to work for the Wikimedia Foundation at the moment and have sort of been sucked into wiki-culture backwards, first as a contractor and now as a staffer. Anyway, the point, finally: Wikipedia discourages the use of primary sources. The basic idea here is that an encyclopedia is a tertiary resource. Wikipedians don’t do fact-checking or original research. It is merely a compendium of things that other reliable sources have reported. Since primary authors often have bias, the secondary source (or a peer-reviewed primary source) is preferred. As you can expect this is becoming less and less of a viable strategy, since for the most part the media have abandoned their traditional role as fact checkers. And something like Assange’s scientific journalism may be the answer. One Wikipedia article writer has taken to videoing people, posting the video online, and then using that as a citation for quotes.